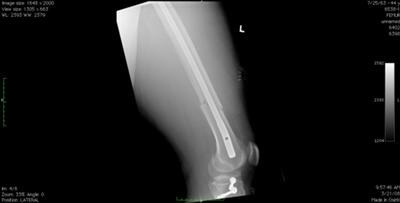 Surgeon put a rod in my leg - left hospital after 4 days on crutches. At first followup, (knee in constant pain) - doc informed me that my knee was also damaged, sent me for an MRI. MRI showed torn ACL and damaged meniscus - sent me to pre-surgery physical therapy to try to regain strength and Range of Motion (ROM) before surgery - went 3 weeks - could only achieve 90 degrees flexion and still 10 degrees from extension. Have had issues with swelling since the accident. Had surgery on outpatient basis (about 2 months after the injury), first few days felt really great - then the swelling took over (again) - at 1 week visited physical therapy again - 18 degrees from extension and 87 degrees flexion. 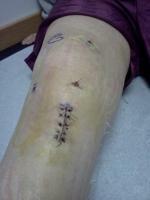 Also saw doc that day - said he did an allograft of the ACL and trimmed the meniscus. Now doing physical therapy 3x week - at 5weeks I am 8 degrees from extension and 111 degrees flexion. The stronger your leg is and the better the ROM going in, the faster you will recover. Do everything the Physical Therapist tells you to. I have been visiting a massage therapist - that helps get the muscles moving again too. Even when it starts feeling "normal" don't push it - give your body the 6 months to heal before doing anything risky. ICE - 20 minutes every hour or use a circulating ice machine - essential the first week - and everytime it feels hot, 20 minutes every hour.